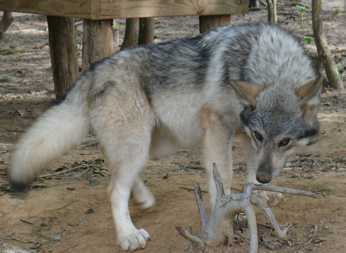 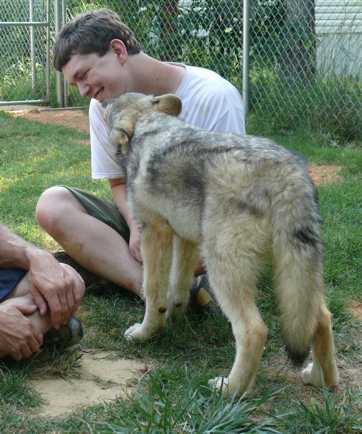 An early Spring in 2007 brought Wolf Howl Animal Preserve a special treat. 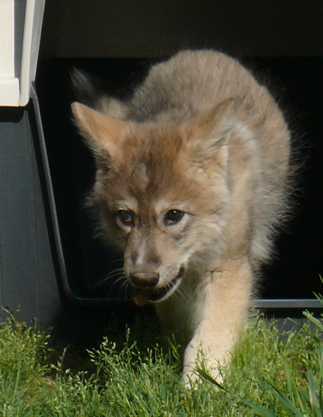 Four new Wolf pups were born to Ohoyo and Wa-ta-chee, our Alpha Female and Male. 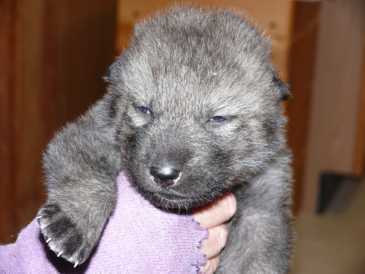 See the Wolf Pup Video of Ohoyo and her pups shortly after their birth. 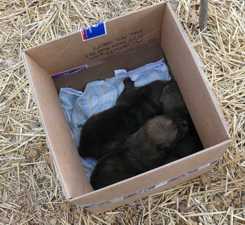 The Pups were pulled from the den at 8 days old due to expected heavy rains and the chance of the pups drowning in their den. 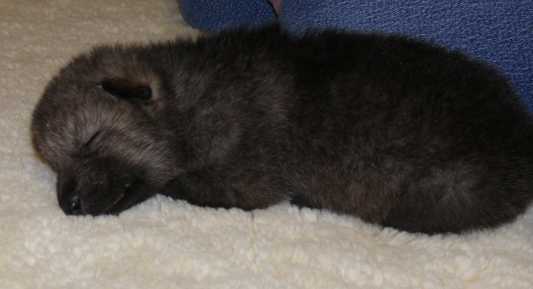 They were all good size pups, the smallest being 2 lbs 5 oz. 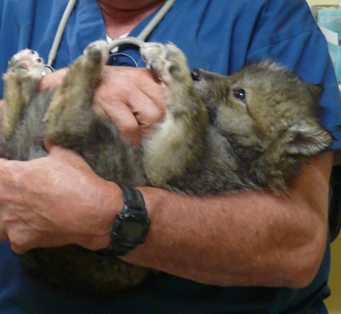 and the largest 2 lbs 12 oz. 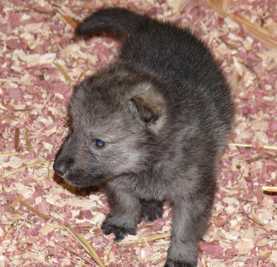 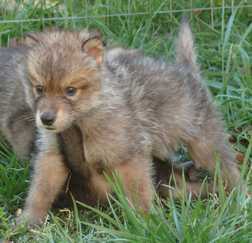 There were three females Wolf Pups and one male Wolf pup. 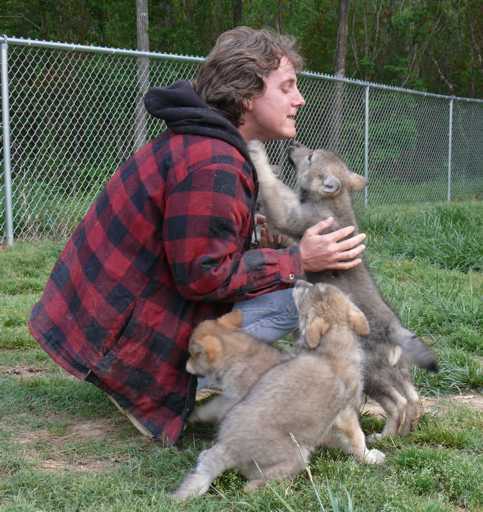 The pups were brought into the nursery where they were hand-raised and bottle-fed to socialize them to humans. 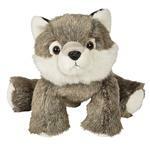 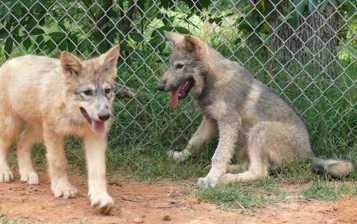 * This makes their lives in captivity less stressful and in routine medical procedures and emergencies makes treating the Wolf so much easier. 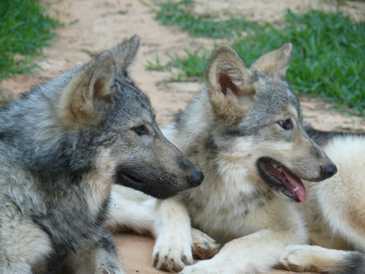 After a short period of time, 3 months, they were returned to the main enclosure to live with their Wolf Mother, Wolf Father and rest of the pack. 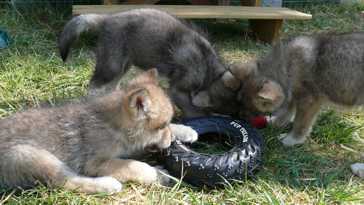 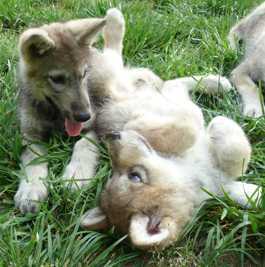 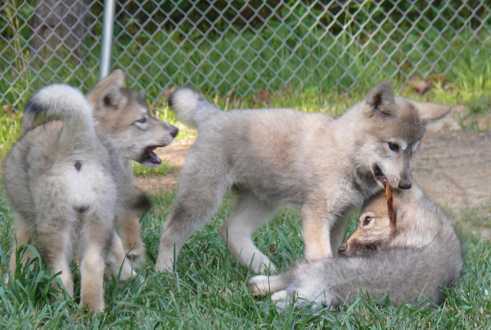 The Wolf pups spent some of their time living in the home of the Founder and her Husband, Maria and Donald Ferguson. 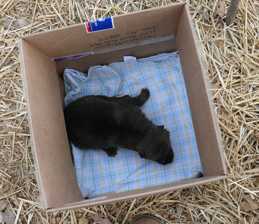 Some of the evenings had been too chilly to keep the nursery at 80 degrees which is required until the pups can regulate their own temperatures. 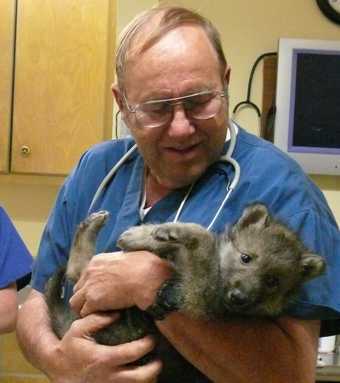 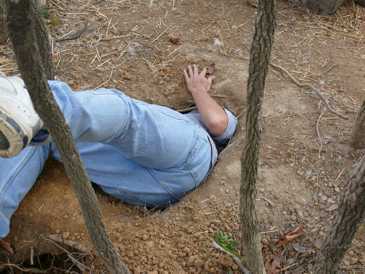 That was a very eye opening experience for the caretakers and pups alike. 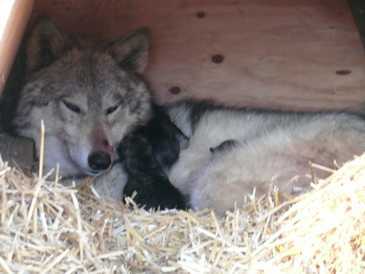 They have bonded nicely and enjoyed their cuddly home in a lambswool lined garden tub. 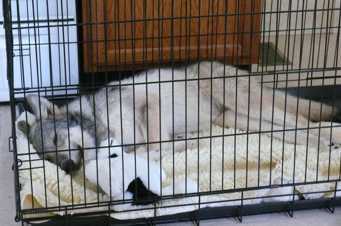 Meal times allowed them to explore the kitchen and adjacent rooms of the home. 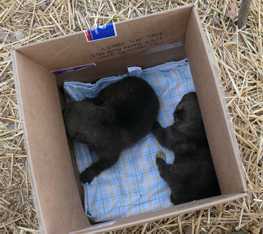 When they were in the nursery, they could climb up onto the mattress where the caretakers slept with them and explore the building which is 12x20. 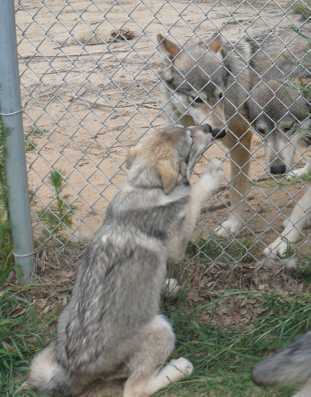 They had their own fenced in yard to play in when the weathered permitted. 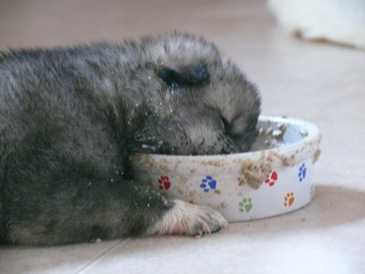 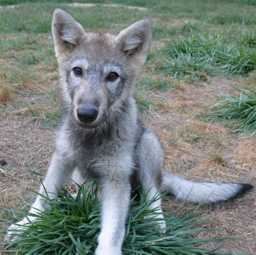 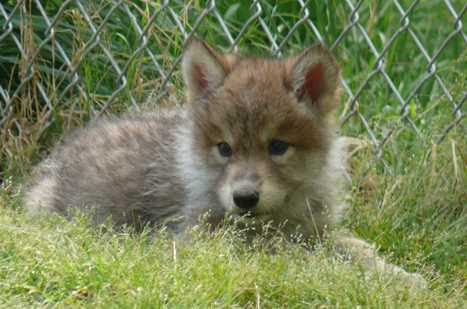 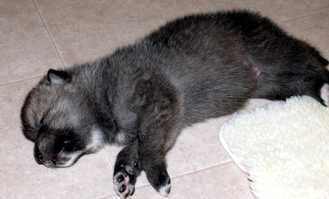 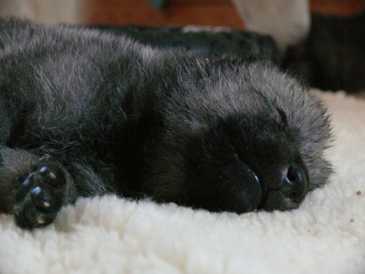 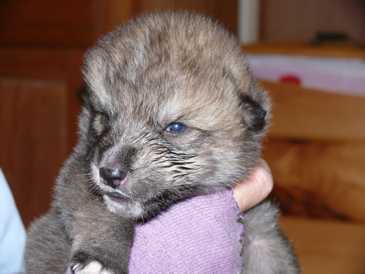 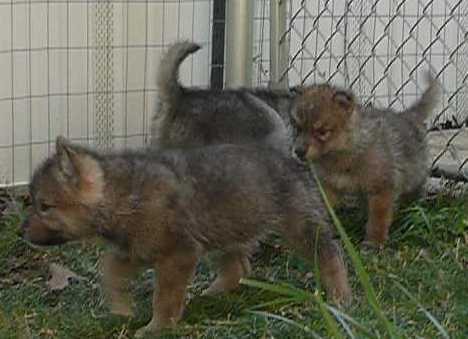 Check out a video of the Wolf pups at 4 weeks old. 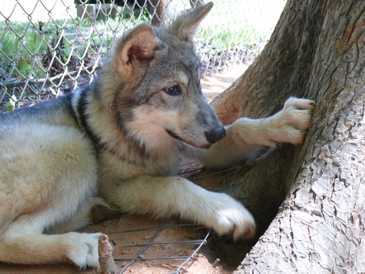 Since our Wolf pups are now 2 years old, we've included their grown up pictures and stories in Meet Our Wolves! 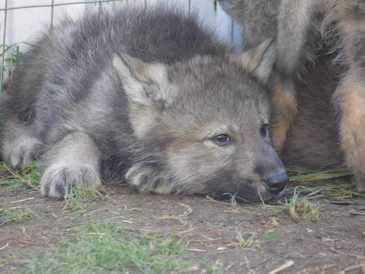 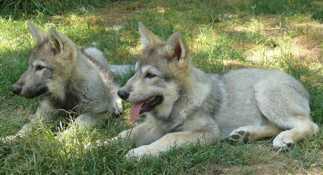 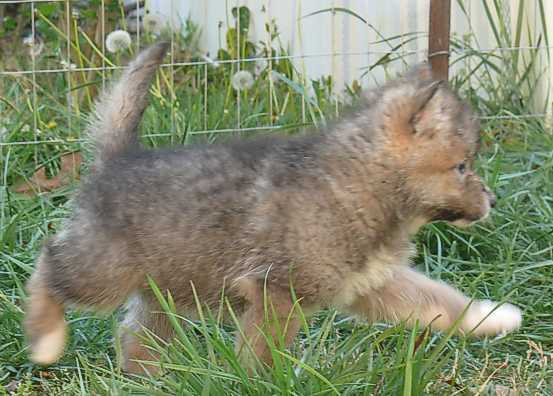 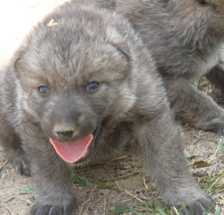 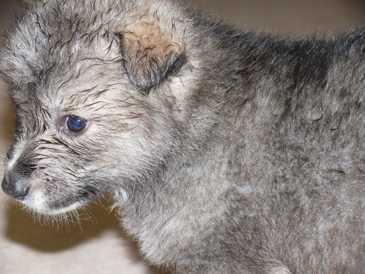 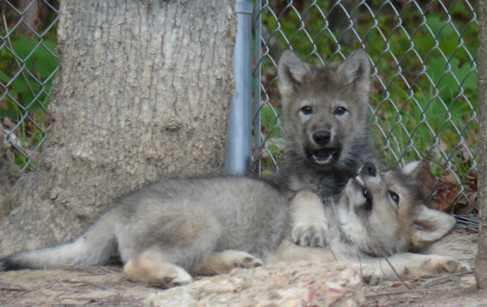 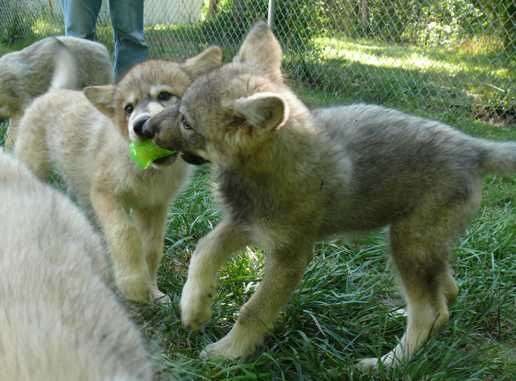 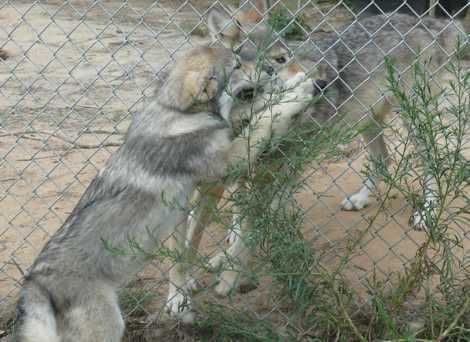 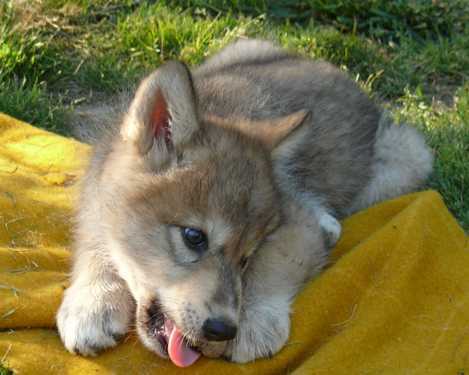 On this Wolf Pups Page you can enjoy pictures of them from the time they were pulled from the den, while they were being socialized to humans and when they were returned to the pack. 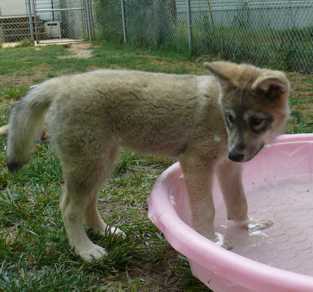 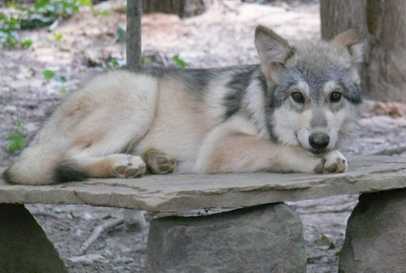 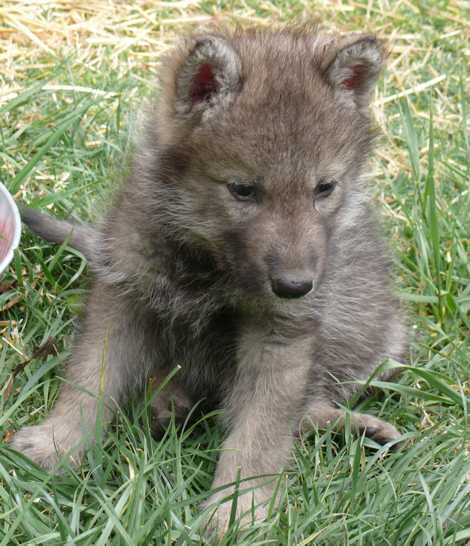 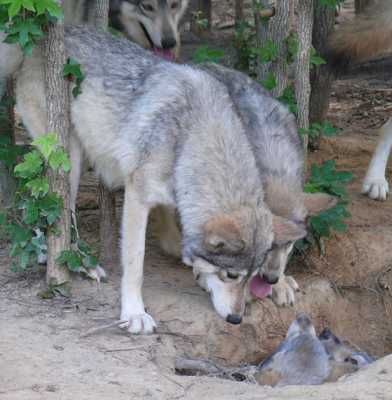 Starting in July of 2008 we made a section in our Wolf pictures Gallery for each of the yearling pups. 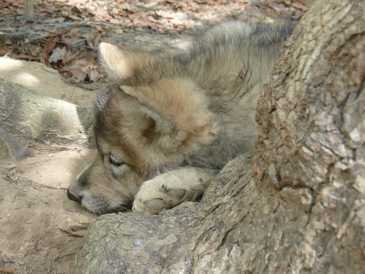 We will continue to add pictures to these galleries until they are full. 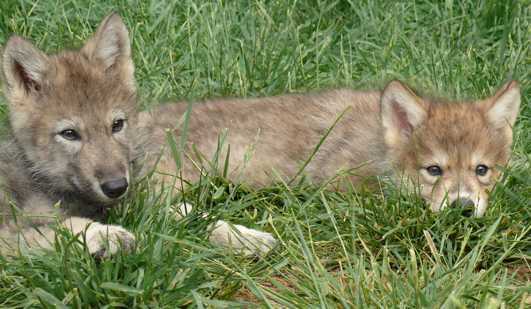 For information on symbolically adopting (sponsoring) one of our Wolf Pups or Adult Wolves, click here.